When Jeremy told me that our next Christmas song would be the beautiful “Oh Come All Ye Faithful” I was delighted. Not only do I like the song in Latin and in English, but also, I like many recorded versions, especially Nat King Cole’s 1960 recording. Surprise! As I did my research, I watched the YouTube video of Nicki Minaj’s Grammy performance spectacle where she sings “Roman Holiday” with a supporting cast of dancers in religious costume performing inappropriate and mocking gestures. The chorus in the performance sings the opening of “Oh Come All Ye Faithful.” It was difficult to see anything positive in her portrayal of the sacred. Yuck. 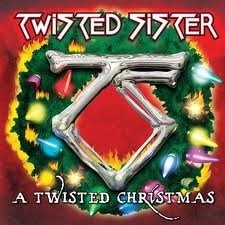 Also in my quest for performances, Twisted Sister’s video was listed before many classic versions. I watched the whole video, beginning with the satire of a young couple exchanging gifts in a classic holiday living room. The band then crowded in and sang the song accompanied by heavy metal sound and depictions of the female letting her hair down and getting excited by the sacred music. While some might enjoy this version, it is not for me. Tomorrow, I’ll revisit the song and the more traditional recorded versions. There’s a lot of interesting history about this carol, which was written and sung long before most other Christmas tunes. What recording of the song do you like? Podcast #30- 146 Days to Go! Podcast #30- Click here to listen to this week’s Podcast- Which tree will it be? This week we dish on the week in review and share all the details on being added to the list at Stitcher. 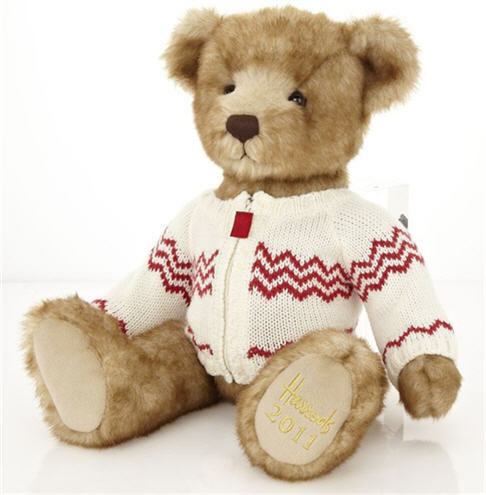 Brief overview of the hunt for Christmas in London during the 2012 Games and the #5 secret for a successful holiday are discussed. 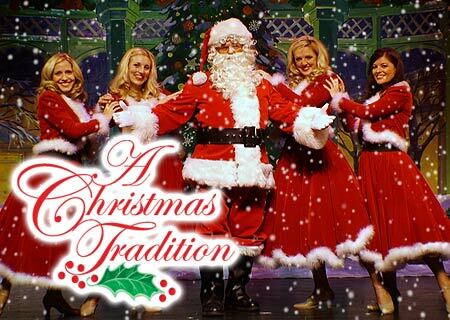 We review the importance of planning now for your Christmas happenings. It is really coming soon! Most importantly we get to the dish on the them for the Yule Log tree at the Festival of Trees. Listen in to hear the ideas and let us know which to pick! Stitcher is the Pandora of the talk radio world. Since May 2011, I have logged 100 hours and 49 minutes (399 episodes) of pure listening joy. My “Favorites” stations are personalized to me, and if a stranger examined all 24 stations, he would get a snapshot of my eclectic personality. I listen to “The Moth Podcast,” “Grammar Girl,” “Stuff You Missed in History Class,” “Scientific American’s 60-Second Mind,” “Marketing Over Coffee” and much more. These favorites are “stitched” together so that I have a constant stream of podcasts. “The Yule Log 365” is now at the top of my favorites! Yikes! Founded in 2008, Stitcher Radio had been featured as a top app in PC Magazine, won a Webby Award, and it’s available on most platforms, Kindle Fire, iPhone, and more. To add a station to my personalized list, I use the search tool; however, I rely mostly on the suggestions mailed to me weekly. For example, since I like geeky science stuff on “60-Second Mind,” I can scroll through the Listeners Also Like and sign up for “Brain Stuff” (sponsored by HowStuffWorks.com). It’s easy to add a favorite and to delete it if several episodes don’t excite me after all. (Please do not delete “The Yule Log 365!”) The app uses the same thumbs up/thumbs down symbols as Pandora. Each time I open the application, I am invited to refresh my content, so the most recent podcast is updated. The NPR “Car Talk” Podcast updates on Saturdays, but below the current episode, there are Recent Episodes: I can listen to Click and Clack in succession, ad nauseum, if I so choose. If you fall behind on our Monday podcast, you can check in the recent episodes to listen to us. The app provides free online streaming, so there’s nothing to update or download in iTunes. I find that the advertising, which appears about as frequently as it does on Pandora, is, of course, marketed to my tastes, so the advertisements have led to exploring BetterMint.com and Audible.com. I sound like a sucker, but they’ve got me pegged. Stitcher gives me the ability to browse Live Stations. The Stitcher Front Page streams current stories. The Bookmark tool can mark any place I am in a podcast, but, usually, I don’t get that technical. Unless I refresh the content, Stitcher remembers where I was. My favorite type of talk radio is storytelling, but there’s every category of interest. Since I started listening to “The Moth Radio,” I’ve added favorites like the “NPR: StoryCorps” and “The Stoop Storytelling Series in Baltimore.” Interestingly, there’s plenty of room for podcasts from the highly professional to the basement production. (Jeremy and I are still in our podcasting infancy, so it’s cool to be ranked with the professionals.) I like the idea that good content reigns supreme, and the little guy (that’s us), with the right idea, can build a following. During our visit to the Christmas Spirit shop in Rehoboth Beach, my mom and I saw a beautiful display of Ne’Qwa Art ornaments, one of which is pictured here. I read a little more about this ancient Chinese art and watched a video of the painting process. The prices for the ornaments range between $30 and $60, which is steep, but then I considered the hours that go into painting in reverse from inside the glass ornament. This requires specialized training, unusual brushes and etching. The painting begins with the foreground and then moves to the background. I have linked a video of the process here. 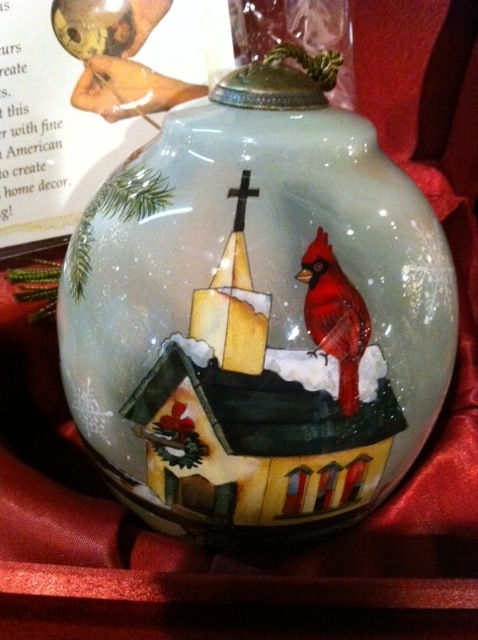 If you are interested in looking at the newest ornaments for 2012, here is one website that features the ornaments. This is ONE craft I won’t be attempting on my own. This week I am lucky to be visiting London for the 2012 Summer Olympic Games. London is definitely a city rich with history and tradition. As I write this the official opening ceremonies have completed and the torch has been lit. Everyone in the city, every locations, and nearly every person is all about the games for the next fortnight. 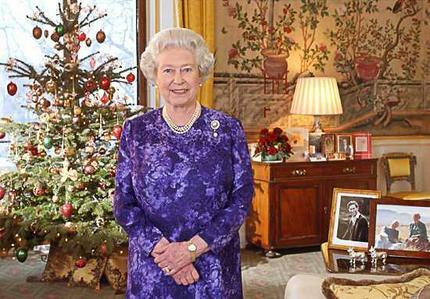 So where might Christmas fit into all this sport spectacle and British pride? Everywhere of course! On a previous visit to London I was in the city at holiday time. Everywhere was full of the sounds, sights, and smells of Christmas. Every church and museum was dressed up with holiday finery and the bustle of the city was alive. Attending a concert at Westminster Abbey, shopping along the stalls at Camden and Covent Garden, and navigating the thick throngs of people at Harrod’s were part of my whirlwind tour. This week while I am here I hope to discover some of the plans for the 2012 celebrations. I hope to get my hands on some of the Christmas recordings from both St’ Paul’s Cathedral and Westminster Abbey. I might even discover some unique holiday decorations or candy treats to bring home with me. Cheers!! What theme for our tree? My mom is always helping me to brainstorm great holiday ideas. Today she accompanied me to Michaels for holiday craft supplies, and we made a visit to Christmas Spirit on Rehoboth Avenue in Rehoboth Beach, Delaware. 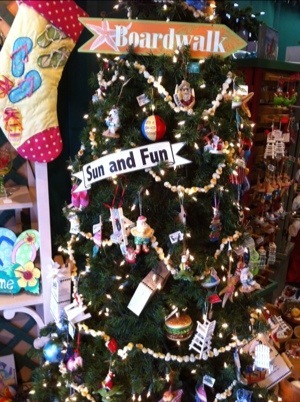 In the store entrance we saw this tree decorated in a beach theme. Mom liked the white lifeguard chair ornament. This air conditioned wonderland got me fired up to consider how Jeremy and I are going to decorate our tree for the Festival of Trees in November. 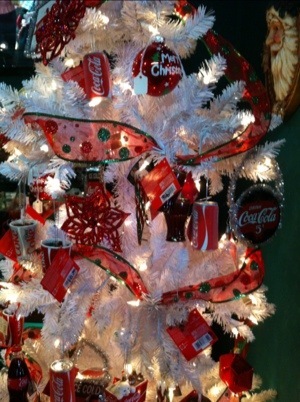 The Coca Cola tree was breathtaking, especially in the cool dim light of the store. I loved the ballerina tree and the wedding tree, but I don’t think I’ll be able to talk Jeremy into these. A patriotic tree or music tree (there were both in the store) would be great. 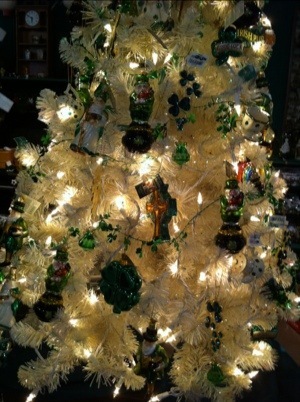 The Irish tree was really unique–could we assemble a tree reflecting a particular nationality? A little off the beaten path: how about a gambling tree? I don’t know if all of our readers can support this, but Maryland has a rich horse racing tradition, and this could be enhanced with other games of chance. Items we could collect would be dice, playing cards, Monopoly money and more. I bet I can find some exciting crafts to make out of playing cards. What I learned from the experience is that The Christmas Spirit store is the springboard for decorating imagination. We bought three ornaments, two with a knitting/crochet theme. How about that for a tree? I know I could ask my aunt or Roger’s sister for help with a crocheted garland!